In ancient China there is a legend that one day a child will be born from a dragon, grow to be a man, and become the best developer in the world. That man is not Ivan, because Ivan has beaten that man. There are no Ivan stories, only IVAN FACTS. When Ivan was born the only person who cried was the doctor. Never slap Ivan. During his National Service, Ivan threw a grenade and destroyed 10 trees. Then the grenade exploded. There are no dangerous wild animals in Singapore. Ivan ate them all. Ivan has the best poker face. He won a World Championship of Texas Holdem Poker with two UNO #5 cards in his hand. Ivan can pick durians from a banana tree and squeeze sugarcane juice out of them. Ivan’s computer has no backspace button. He doesn’t make mistakes. There is no ctrl button either. Ivan is always in control. Some people chew bubblegum. 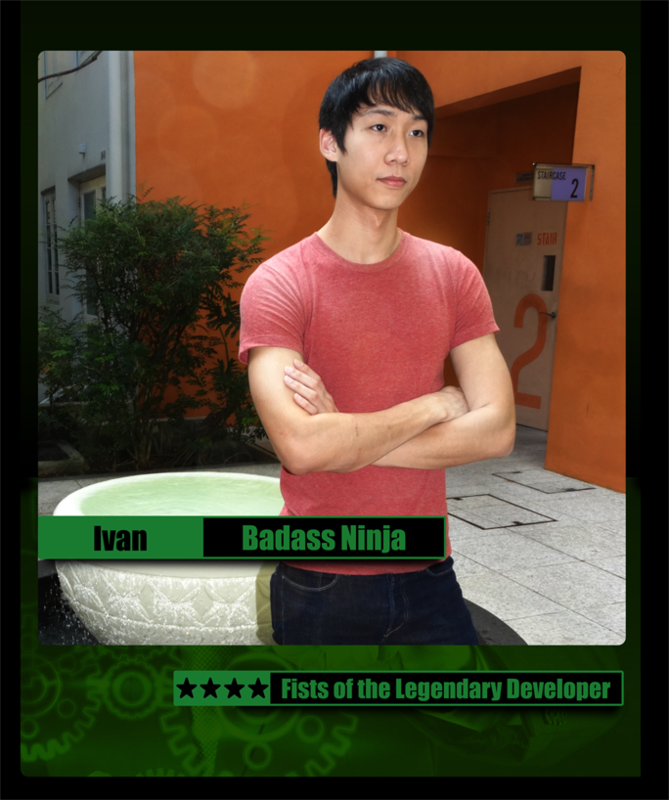 Ivan can blow bubbles by chewing bak kwa. Ivan once defeated a brick wall in a game of tennis. Ivan can divide by zero. Ivan can kill two stones with one bird. Ivan wins DOTA 2 competitions using a Guitar Hero drumset as his controller. Once a cobra bit Ivan’s leg. After three days of pain and suffering, the Cobra died. Ivan studies Computer Engineering at NUS. Ivan is developing our developer’s site.